Reverse obliquity IT fracture: use IMHS. Unstable IT fracture (posteromedial comminution): use IMHS. Nonoperative treatment (early mobilization is key, varus shortened malunion). Ensure tip-apex-distance (TAD) is <25mm. TAD=distance from the tip of the scew to the apex of the femoral head on the A/P view added to that of the lateral view. (Baumgaertner MR, JBJS 1995;77A:1058). Use regular length barrel unless fracture line will cross barrel, then consider short barrel. Generaly need >10mm available for sliding. IF using 85mm lag screw or shorter consider using short barrel. Consider adding superior derotation screw for basicervical fractures. Biomechanical studies have not shown this to be beneficial. Ensure true AP and lateral views of C-arm can be obtained with c-arm. Hemipelvis is often rotated posteriorly requiring "over the top" rotation of the c-arm or internal rotation of the leg to obtain true AP and lateral views. Arrange instruments from left to right in the order on a Mayo stand. Shower curtain drape. Consider using a self-retaining abdominal retractor to retract tensor fascia lata and a broad Hohmann placed behind the abdominal retractor to retract the vastus lateralis. Supine position on fracture table. Well padded sacral post. All bony prominences well padded. Ensure there is no impingement of the labia or scrotum. Fracture reduced under c-arm guidance. Generally gentle longitudinal traction with leg externally rotated followed by internal rotation. Make neck and shaft perpendicular to the perineal post which will make them parallel to the floor and aid in guide wire placement. Uninvolved leg is flexed, abducted and externally rotated to allow lateral views with c-arm. Ensure there is no residual varus angulation / posterior sag / or malrotation prior to prepping and drapping. Acceptable reduction: medial cortical contact between the major proximal and distal fragment on the AP view and posterior cortical contact on the lateral view. Assess varus or valgus position by the relationship between the tip of the greater trochanter and the center of the femoral head which should be coplaner. If the center of the head is distal to the tip of the greater troch, the reduction is in varus. If the center of the head is proximal, the reduction is in valgus. Also compare center of head / great troch relationship to normal hip films. Varus correction: additional traction or abducting the lower extremity. Confirm there is no posterior sag on lateral view which may prevent adequate reduction. Posterior sag correction: Most modern fracture tables have an adjustable pab that can be added to apply anteriorly directed force and reduce posterior sag. Manual correction can also be done using a crutch, bone hook, or periosteal elevator. Use guidewire to draw a line along the anterior hip/thigh in the desired position for the screw. Straight lateral incision starting at the vastus ridge and slighlty posterior to the midline. For a 135°- plate, the entry point is generally 2 cm distal to the vastus lateralis ridge near the gluteus maximus insertion or in-line with the tip of the lesser trochanter. For higher angle plates, the entrance site is 5 mm distal for each 5° increase in barrel angle. 5 mm/5° proximal for lower angle plates. Identify and ligate the first femoral perforator. Generally found near the gluteus maximus femoral insertion, 4 to 6 cm distal to the trochanter. Elevate vastus lateralis off intermuscular septum. Place guide pin in center-center position on both A/P and lateral views within 1cm of subchondral bone using the 135° angle guide. Measure screw length. A 95mm screw is typically used with a 135° plate. Ream femoral neck under c-arm guidance. Ensure pin does not advance. Tap the entire screw path to prevent femoral head rotation with screw placement. This is especially important for left side fractures in which screw insertion tends to rotate and displace the femoral head. (Mohan R, Injury 2000;31:697). 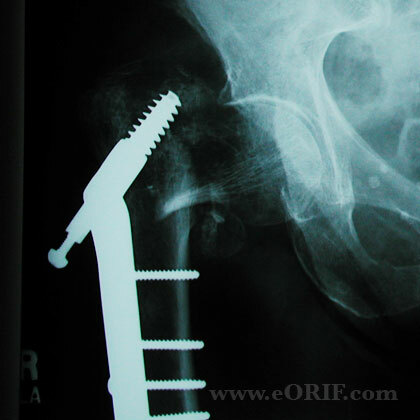 Right hip fractures tend to displace to an apex-posterior angulation during lag-screw insertion. Left hip fractures tend to displace to an apex-anterior angulation. Consider insertion a temporary derotation pin proximal to the guide pin if rotation occurs or for basicervical fractures. Place plate and impact against lateral cortex. Clamp plate with reduction forceps. Release traction. Impact fracture with several taps on leg. Insert compression screw if there is risk of screw-barrel disengagement (if its difficult to see screw within the barrel). Compression screw is generally not needed unless short barrel plate is used. Post-op: WBAT. DVT prophylaxis is indicated. -Time to functional return is faster for patients who are allowed to weight bear early, presumably because those patients unable to maintain a strict non weight bearing status are left in bed for extended periods of time. (Koval KJ, JBJS 1998A;80:357). -Cognitively intact elderly patients with no other significant comorbidities, stable fracture patterns, and a well placed fixation device should be allowed to be either partially or fully weight bearing within 24-36 hrs after surgery. 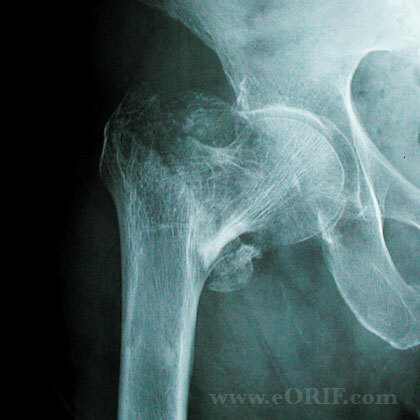 -Elderly pts with fragility fractures should be evaluated for osteoporosis. 7-10 Days: Wound check, eval reduction on xrays. 6 Weeks: Evaluate reduction / fracture union / consolidation on xrays. 3 Months:Evaluate reduction / fracture union / consolidation on xrays. 6 Months:Evaluate reduction / fracture union / consolidation on xrays. 1Yr: Assess outcomes, evaluated xrays for posttraumatic osteonecrosis. 2Yr: Assess outcomes, evaluated xrays for posttraumatic osteonecrosis. 3Yr: Assess outcomes, evaluated xrays for posttraumatic osteonecrosis. After hip fracture the vast majority of patients require assistance in performing ADLs. Only 20% to 35% of patients who were independent in ADLs before fracture will regain their prefracture ADL independence. Factors predictive of recovery of function in ADL are younger age, absence of dementia or delirium in nondemented patients, and a strong social network. (Koval KJ, JAAOS 1994;2:141). 96% satisfactory results (Kyle RF, JBJS 1979;61A:216). 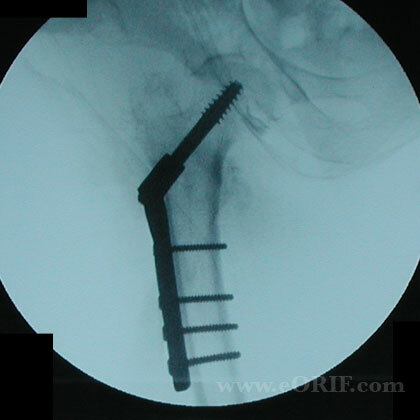 Koval KJ: Intertrochanteric fractures: Use of a sliding hip screw, in Wiss DA (ed): Master Techniques in Orthopaedic Surgery: Fractures, ed 2. Philadelphia, PA, Lippincott Williams & Wilkins, 2006, pp 233-248.